with regret of his not having been graduated from some technological institute, he answered that the fact, on the other hand, was very fortunate. If he had taken a course at such an institution, he would have acquired such a belief in authorities that he would never have been able to develop originality and make his own way in physics and mechanics. 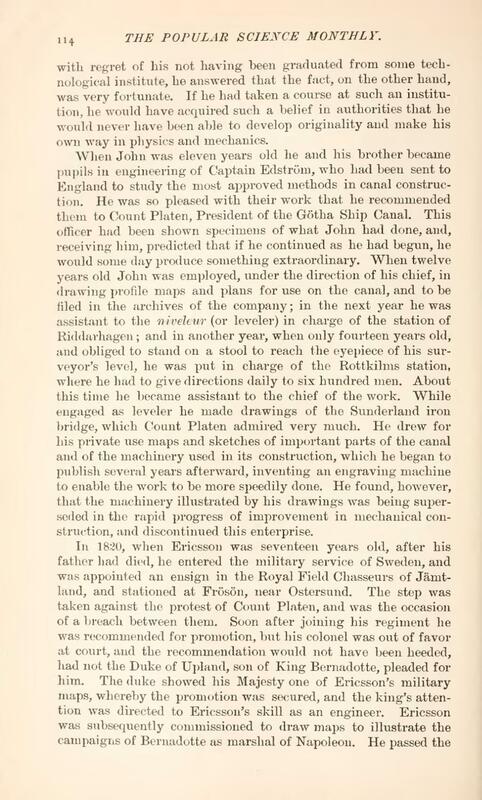 When John was eleven years old he and his brother became pupils in engineering of Captain Edström, who had been sent to England to study the most approved methods in canal construction. He was so pleased with their work that he recommended them to Count Platen, President of the Götha Ship Canal. This officer had been shown specimens of what John had done, and, receiving him, predicted that if he continued as he had begun, he would some day produce something extraordinary. When twelve years old John was employed, under the direction of his chief, in drawing profile maps and plans for use on the canal, and to be filed in the archives of the company; in the next year he was assistant to the niveleur (or leveler) in charge of the station of Riddarhagen; and in another year, when only fourteen years old, and obliged to stand on a stool to reach the eyepiece of his surveyor's level, he was put in charge of the Rottkilms station, where he had to give directions daily to six hundred men. About this time he became assistant to the chief of the work. While engaged as leveler he made drawings of the Sunderland iron bridge, which Count Platen admired very much. He drew for his private use maps and sketches of important parts of the canal and of the machinery used in its construction, which he began to publish several years afterward, inventing an engraving machine to enable the work to be more speedily done. He found, however, that the machinery illustrated by his drawings was being superseded in the rapid progress of improvement in mechanical construction, and discontinued this enterprise.